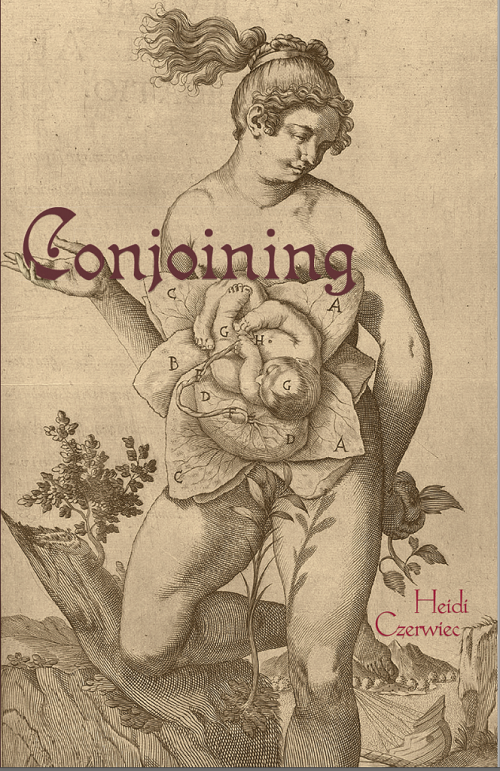 Conjoining, by Heidi Czerweic. Greensboro, North Carolina: Sable Books, December 2017. $14.95, paper. As with me seeing the coffiin-esque iron lung in the basement museum of the Nobles County Library, surrounded by photos of smiling polio victims inside various other iron lungs, and making sure I never went to the basement museum alone ever again, any gaggle of able-bodied and world-curious five-year-olds would no doubt concur, upon first seeing Stephen W. Hawking, former Lucasian Professor of Mathematics, part man, part machine—more it seems machine than man—that he is a kind of monster. Their learned and A Brief History of Time-owning parents (whether they’ve read it all or not) would shush their offspring, seeing not monstrosity but brilliance. That both perspectives live in the short, tall, young, and old amongst us is central to the poetry in Heidi Czerwiec’s Conjoining, wherein the hard flesh that is pounded (because, yes, we need to tenderize it) is how “Humankind’s uncomfortable with ambiguity— / it wants us fixed upon a pin, affixed, / Splayed, displayed by naming.” The title is a verb because the action of understanding requires perpetual bridging from this to that. In “Teratoma” (a teratoma is a tumor composed of various tissues, in its most spectacular incarnations containing hair and teeth), we read, “the headache / it’ll cause till you excise it, false / twin who, once repelled, you can’t repulse.” This book itself, the poems that comprise it, are Czerwiec’s (SIR-wick) moveable bridge. That a central aspect of the structure is a framework of children’s alphabet books (A is for ____ , B is for ____) is indicative of the poet’s yearning to edify on more than one level. The poet as autodidact is reminding the self; the poet as witness is holding in her hands and turning the heads of readers to see; the poet as mother is leaving a record—a gift—for her child. In “A Is For A-KÉ, The CHINESE MONSTER and the Tragedy of P, His Parasitic Twin,” we see a three-headed approach in the poet’s depiction of the twins’ mother’s perception that what has emerged is, “A son to worship // me; a son to be worshipped,” which the speaker, via the poet’s conjuring, “thought and, dying, died.” As readers, we receive this same gift of perception but are left to live with the consequences, and the responsibilities. The elderly return, following the trails of mushrooms shining in the forest, find their way back by the light of their own throats. In the Russia under Russia it is daylight all the time. They prefer to die on familiar contaminated soil than in the anonymity of cities. Around them the forest thrives, crackling alive—the world’s background noise increased threefold, its jaw a galvanized fist chattering—static hum, hidden in the milk like spilt glitter. The say the lost come back as boars, as luminous deer, as swallows, songs in their scarred throats, frayed breath a vicious hissing. The italicized portions come from source material on the Chernobyl nuclear legacy. It is hard to have lived any sort of life and not see yourself cycling through Cerwiec’s own breadth, as if in making poems she were making the weather that visits us all. In the X-men comic books and movies, the brilliance of the monsters comes in the form of one or several easily identifiable superpowers. But Professor Xavier had it easy. The brilliance of the monsters in Conjoining is harder to suss and steer toward the good. When Stephen Hawking’s body began to fail him greatly, he found, he says, a repose in being able to think and think primarily. Such repose seems to be the state of mind and body of the Conjoining poet, who is arrested not by bodily decline but by the notion not just of impending motherhood, but of motherhood via surrogate, via adoption. Mothering not of necessity but of choice. A kind of mothering offered, subtly, for the reader to accept as fellow parent or as child or as human monster among the same. No judgments made. Matt Mauch is the author of three books of poetry, Bird~Brian, forthcoming in 2017 (Trio House Press), If You’re Lucky Is a Theory of Mine, which was the 2012 open-reading period selection by Trio House Press, and Prayer Book (Lowbrow Press). He is also the author of the poetry chapbook The Brilliance of the Sparrow (Mondo Bummer). He founded and has since passed along the annual Great Twin Cities Poetry Read and the Maeve’s Sessions readings at Maeve’s Cafe along NE Mpls’s in/famous Poetry Row. A Minnesota State Arts Board Artist Initiative grant recipient, Mauch heads the staff at Poetry City, USA, an annual collection of poetry and prose on poetry, and teaches in the AFA in Creative Writing program at Normandale Community College. He lives in Minneapolis.